Our E-Discovery Toolkit for Subprime Litigation contains white papers, articles and other resources to help corporations better understand, prepare and manage e-discovery for subprime litigation. Process, people and tools are the three main components of a successful subprime litigation e-discovery program, and this toolkit provides resources on all of these. How can cross-company teams develop defensible and repeatable processes for subprime litigation, and set the foundation for future compliance initiatives? 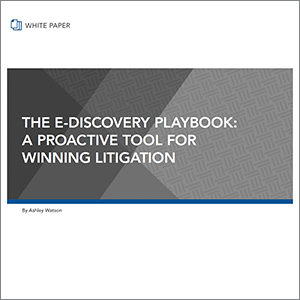 How can e-discovery be used as a proactive tool for subprime litigation case strategy? How can corporations quickly and effectively assess their risk? This article looks at the formidable IT challenges created during litigation - and how control can be maintained without exposing more corporate data than necessary. This article looks at some of the additional benefits and then discusses the key processes, technology, and time frame for an effective litigation evaluation formula.